There’s a thread on TFN’s prequel board called TPM Is Now My 2nd Favorite Movie where a fan finds appreciation for Eppy I. Better than last or not at all, right? Kyle Newman will have an article in the next Insider on TPM. About freakin’ time! Insider #128 will come out next month. The Official Star Wars.com blog promoted a dopey (and not real funny) feature on a site called Dorkly.com that seems harmless enough. But Dorkly also featured a similar list called “7 Quotes That Could Have Saved The Star Wars Prequels,” which as you can imagine weren’t real complimentary to the films or to Lucas. While the blog didn’t link to that (or at least not yet), aren’t they aware of it? If so, why promote a site that disparages half the saga and the man who signs their paychecks. You can’t convince me that Lucasfilm isn’t its own worst enemy. Shawn sent a link to this review of “The People Vs. George Lucas.” I don’t think this guy is an unabashed fan of all of the movies but he raises the point that people, especially kids, love the prequels and wonders why Clone Wars doesn’t figure into this at all. Every now and then, somebody starts a worthwhile thread at TFN. The latest one asks for the top 100 things you love about Eps I-III. The unofficial date for the Season 3 DVD/Blu-Ray release before was October 25, but today starwars.com revealed the release date is one week earlier, October 18.
Who better to trust with your money than the clone trooper who suddenly turned on Obi-Wan ;)? Diamond Select Toys will release its Commander Cody bank this October. Visit Rebelscum for more info. 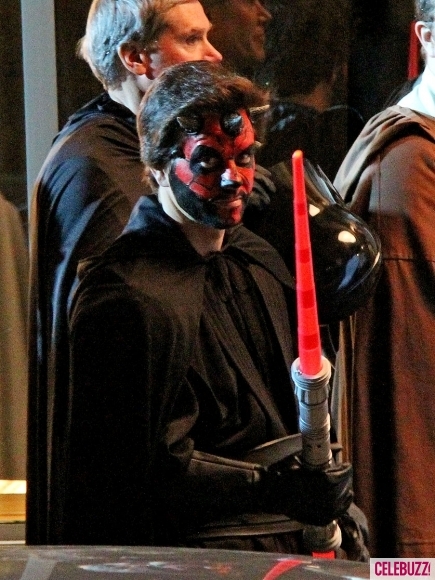 Mark Wahlberg As Darth Maul? No, it’s not a remake but it is part of a film called “Ted,” where in one scene Wahlberg and friends go to opening day of TPM. See more pictures at Celebuzz.com. It’s a new/old interview with our old buddy Ewan McGregor, apparently done around the time ROTS came out, where he chats about his uncle Denis “Wedge” Lawson. Check it out on British retail site Play.com. Scholastic is going to publish a book called The Wrath Of Darth Maul by Ryder Windham this December. This is a brand-new book that will likely be very similar to Windham’s other kids’ hardcover books about various Star Wars characters. No word on whether it will mesh with Jude Watson’s 2000 softcover book about Maulsy’s early life or not.